Cause We Care is excited to announce another year of partnership with the Capital Direct Matching Program for the 12th annual holiday Care Package Drive. This year’s goal is to raise over $62,000 to provide 850 care packages, filled with food items, essential supplies and small gifts, to be delivered to frontline organizations in the Lower Mainland, in support of single mother-led families and children living in poverty. To support the drive, donate online or sign up to volunteer at www.causewecare.org. Each $75 donation covers the cost of a care package (value over $150) and with support from the Capital Direct Matching Program, every donation is matched dollar for dollar up to $31,000, meaning every dollar donated will go twice as far. Donations can be made in honour of loved ones or in lieu of holiday gifts with dedicated e-cards delivered to recipients. Volunteers are asked to gather on December 11th at the Rocky Mountaineer Train Station to assemble and deliver packages along with handwritten messages of hope. This year, Cause We Care has partnered with Books for Me! and invites volunteers and members of the public to bring gently used children’s books for donation. Complimentary coffee and cookies will be provided by Bel Café and the new Blue Ruby x Cause We Care holiday bracelet collection will be available for purchase, with 100% of the proceeds going directly to Cause We Care. Special thanks goes to Aritzia for keeping mothers and children warm through the winter with donated faux fur scarves, and to the Capital Direct Matching Program for matching donations dollar for dollar. Further thanks to Classic Packaging for the care package bags, Dueck Auto Group, Milani Plumbing Drainage & Heating and Livingspace for providing cargo vans for care package deliveries, Save on Foods (Cambie Street) for providing hamper contents at cost and Urban Impact for recycling from the care package drive. For over ten years Cause We Care has successfully aided local frontline organizations in supporting low-income families across the Greater Vancouver area. 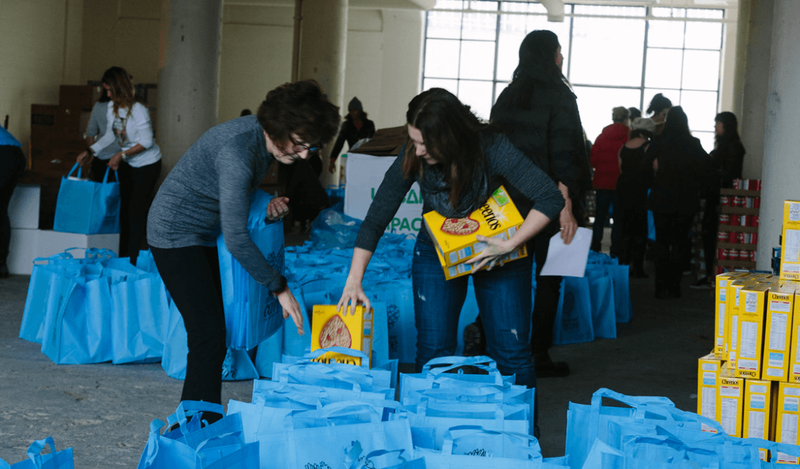 Since 2007 the foundation has distributed over 4,100 food hampers at Christmas, over 1,100 backpacks in September and over 2,500 care packages at Mother’s Day to families in need. Along with the holiday care package drive, Cause We Care hosts an annual Christmas Party for 250 Strathcona residents at the Ray-Cam Co-operative Centre. Community members are invited to enjoy a festive meal sponsored by Hawksworth Catering, and to participate in holiday activities together. To volunteer to help at this event visit www.causewecare.org.